I know this has been asked but I don't see any answers, just comments on the form of the question or responses that don't seem to speak my language. I unintentionally (yes, I meant to use that word) installed Windows 10 on a HP desktop. Since then I can't open web pages, can't print my calendar, some programs don't work while others only function on a part time basis and many other glitches that prevent me from doing my work. After the install I saw a message that said the old files would remain for 30 days then be deleted. I presumed that meant I could switch back. I can't continue to function without a computer. How do I go back (roll back) to the previous version of Windows? The procedure below will only work for 30 days after the upgrade to Windows 10. After 30 days the windows.old folder is automatically removed, which will prevent the rollback from succeeding. For a month after you upgrade to Windows 10, you’ll be able to go back to your previous version of Windows from Settings > Update & security> Recovery. 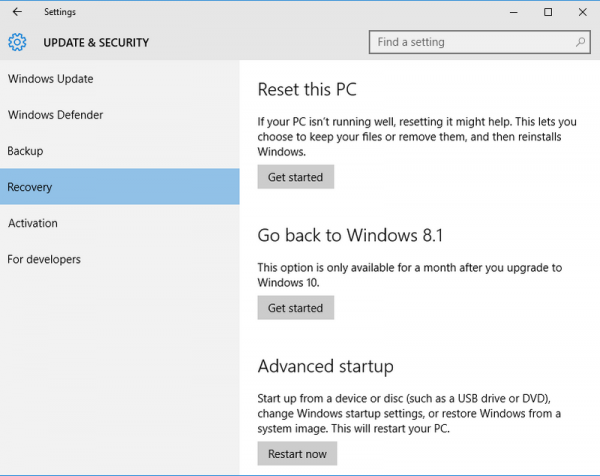 Choose "Go Back to Windows 8.1" or "Go Back to Windows 7" as appropriate ( depending on your original operating system), and Windows will begin the rollback procedure. Keep everything in the windows.old and $windows.~bt folders after the upgrade. Remove any user accounts you added after the upgrade. Know the password you used to sign in to Windows 7 or Windows 8.1 (if you used one). Have the USB drive you used to upgrade to Windows 10 (if you used one). If you go back to Windows 8.1, some apps that came with Windows, like Mail and People, might not work anymore. To fix them, reinstall them from the Store. If you have problems rolling back because of an Administrator account that cannot be removed, please see Administrator account prevents Windows 10 rollback. Not the answer you're looking for? Browse other questions tagged windows-10 uninstall or ask your own question. How to uninstall eziriz .NET reactor?